The best way to identify owls is by their sound. To make your owling outing more productive, try memorizing some local owl calls. Here are some owls which are common across much of North America and a good place to start if you want to learn owl calls. Also check with local experts and bird guides to find out what owls are most common or seen in your area. Great-horned Owl. The hoot of the Great-horned owl might be an easy call to remember, since it is the hooting you’ve probably heard in the background of scary movies. It’s the call you might think of as a typical owl call. It’s a deep hooting call, all on the same tone. 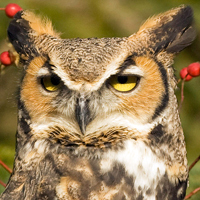 Great Horned Owls sound like they’re saying “Hoot-a-hoot! Hoo hoo”. Eastern Screech Owl. A smallish owl found east of the Rockies, the Eastern screech owl has a slightly spooky and unnerving trill for a call. Like most owl calls, it is unmistakable. And at night in the forest….well it can be a pretty unsettling but exciting sound to hear. Northern Saw-whet Owl. This tiny owl is our bird of the month. The Northern Saw-whet owl’s tiny hooting call sounds like a person whistling the same note over and over again. It’s an easy call to imitate, and Northern Saw-whet Owls are very responsive to it. Finding owls takes a lot of patience. Owls are somewhat secretive and they may not vocalize every night. Hearing owl calls is a special event, and if you spend enough nights in the right spot you are sure to be rewarded.